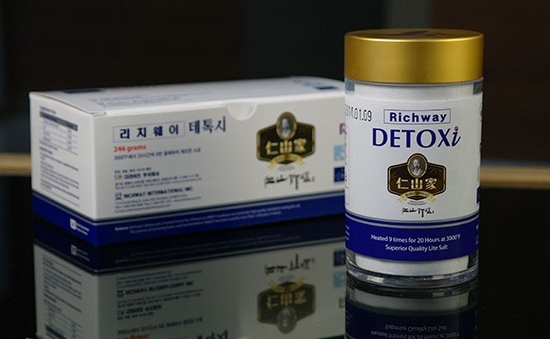 DETOXi salts utilize an ancient manufacturing process that originated 1300 years ago in a Korean Buddhist temple. Natural sun-dried salt is packed inside hollow bamboo sections and heated nine times for 20 hours at 3000° F. with pure yellow ocher. For most effective use, place .5g in an 8 oz. glass of water before a 30-minute BioMat session or 30 minutes before eating (measuring spoon included). This salt is ionized and enhances a BioMat session by preventing dehydration during usage. DETOXi salt has a pH of 7.5 (higher than ordinary salt) and it contains numerous essential minerals and micronutrients such as zinc, magnesium and potassium. It is an outstanding anti-oxidant. This salt assists in discharging toxins through sweat and urine. FDA DISCLAIMER:These statements have not been evaluated by the Food and Drug Administration.